Sunday Quote!- Mythical Wars in the Bible? | J.W. Wartick -"Always Have a Reason"
Sunday Quote!- Mythical Wars in the Bible? Mythical Wars in the Bible? The essay was by Douglas Edwards, whose argument is essentially that Joshua does not recount actual events but rather a mythology with a specific purpose to show that God’s goal of placing Israel in the promised land was fulfilled. It’s an interesting perspective which helps make sense of some pointers in the narratives (and the fact that Judges follows Joshua with discussion of people who were allegedly exterminated in the prior canonical book). However, I’m not convinced we may categorize the narrative as being a mythology, for it seems to have some clear historical claims about how, when, and where Israel entered into Canaan. Indeed, there are other essays in the same book which do not dehistoricize the text while also not putting forward genocide in the Bible. What do you think? How do you interpret the texts which some take to mean genocide occurred in the Bible? How might one maintain Earl’s view and inerrancy, or can one not do so? 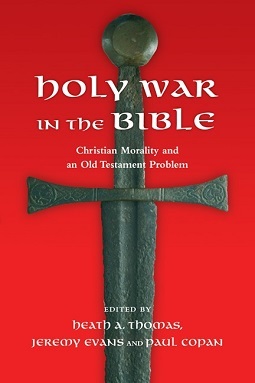 Douglas Earl, “Holy War and Hesed” in Holy War in the Bible: Christian Morality and an Old Testament Problem (Downers Grove, IL: InterVarsity Press, 2013). I think that the realization that the first five books are mythological in intent agrees with today’s Pentateuch (and many of those doing current) biblical scholarship. This will cause problems for those committed to some version of historical literalism found within. But as has so often been the case regarding the Jew known as Jesus, Christians will try to impose their own beliefs on these accounts by creating a gymnastic and sophisticated metaphysical version of them to fit what they desire them to be. Viewing Joshua and the entry of Israel into Canaan as history presents some significant problems in squaring with the archeological record. The biblical narrative suggests a relatively quick and decisive entry and largely successful removal–with significant suggestions of long time interaction with the Canaanite population and culture. The archeological record shows a much longer, tenuous and incomplete takeover. Given that its reasonable to see the biblical account as myth. I see them somewhat more as highly edited summaries skipping over much of the ups and downs and struggles that actually occurred.